Ingredients: Gugo, Omega 3, Lavender, Biotin, Peppermint, Aloe Barbadensis, Centella, Asiatica, Moringa Oleifera (Malunggay), Zingiber Officianale (Ginger), Panax Ginseng, Rosemary and Virgin Coconut Oil as our main base. How to use: Apply to wet hair, massage into a lather, rinse. For best result use it for several months. How does the hair grow? The hair goes through a cycle which lasts for about 2 to 6 years. Each hair grows about 1 cm a month. Under normal condition, 90% of the hair in your scalp is in the growth phase and 10% is in the resting phase. The resting hair will fall out after 2 to 3 months and new hair will start to grow in its place. If hair fall is part of a normal process of hair growth cycle, when does it become abnormal? It is normal to shed 50 to 100 strands each day as part of the hair growth cycle. Beyond this number is considered abnormal. What causes excessive hair loss? Factors such as hereditary disorders, illness, major surgery, hormonal problems, child birth and delivery, medications, infections, stress, air pollutants, and too much exposure to sunlight may cause excessive hair loss. What are the psychological and social effects of hair loss/hair thinning? Excessive hair loss is common in men and women and is viewed as part of aging. Often, men feel less attractive and less masculine when losing hair. Women find it socially disturbing to have thin hair or bald patches. What can stop or prevent hair loss? Treatment will depend on the type of hair loss, but keeping the hair and scalp clean is important in preventing hair fall. If you are taking medicines that cause hair loss, then your doctor can prescribe a different medicine. Also, treating an infection or any fungal scalp condition may help stop hair loss. You may also use shampoo or scalp lotion that could provide nourishment to your scalp, stop hair fall and stimulate hair growth. What is IKUMOU HAIR GROWER SHAMPOO® Ikumou Hair Grower Shampoo® penetrates deep to rejuvenate, nourish and maintain moisture in the scalp and hair. By improving the blood circulation in the scalp, IKUMOU HAIR GROWER SHAMPOO®stimulates hair growth and prevents further hair fall. IKUMOU HAIR GROWER SHAMPOO® also improves the overall appearance of the hair. Is IKUMOU HAIR GROWER SHAMPOO® effective in treating hair loss? Yes, IKUMOU HAIR GROWER SHAMPOO® is effective in treating hair loss. 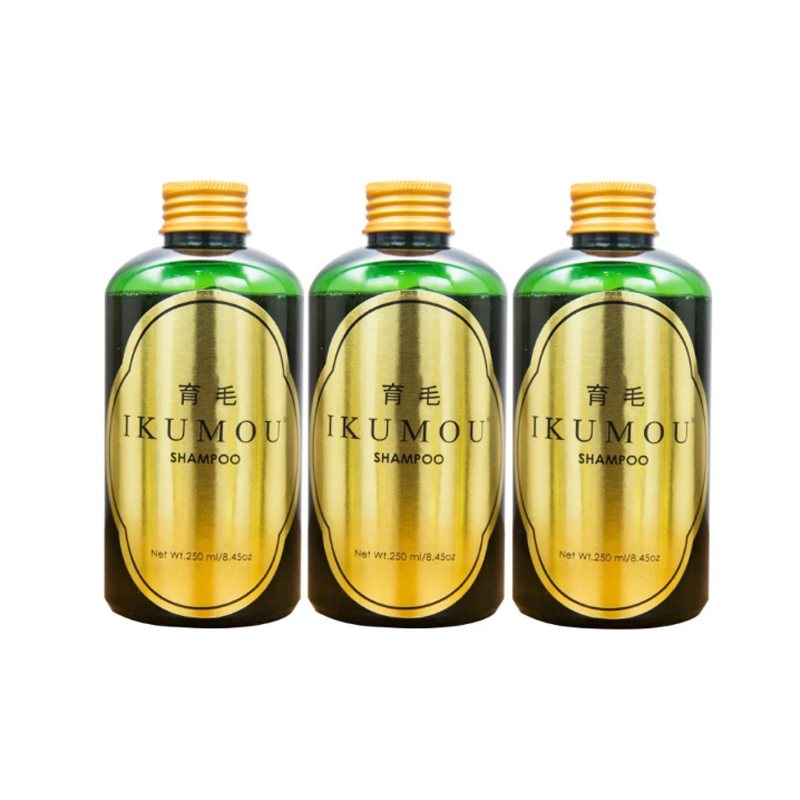 IKUMOU HAIR GROWER SHAMPOO® is a combining highly potent standardized herbs with essential oils and co-factor nutrients, especially chosen for their hair growing properties. IKUMOU HAIR GROWER SHAMPOO® penetrates to rejuvenate the hair follicles, provides optimum nutrition to help combat hair loss and/or thinning of hair, improves blood circulation to the scalp and thus contributes to the stimulation of hair growth. Aside from preventing hair fall and stimulating hair growth, IKUMOU HAIR GROWER SHAMPOO® provides nourishment to the scalp. It also maintains moisture in hair and scalp, thus eliminates dandruff and alleviates scalp itchiness. It also has a cleansing effect and becomes an anti-fungal, anti-bacterial, and anti-inflammatory solution. It prevents premature graying of hair, as well. How much time does one have to wait to see the effects of using IKUMOU HAIR GROWER SHAMPOO®? With consistent daily use of at least two times a day for 4-6 weeks, you can look forward to the benefits of IKUMOU HAIR GROWER SHAMPOOH® in preventing hair loss, retarding further hair thinning and improving the overall cosmetic properties of your hair. Increased number of hair growth will be noticeable mostly on the 4th month, depending on the commitment and frequency of usage. Is IKUMOU HAIR GROWER SHAMPOO® safe to use? Yes, IKUMOU HAIR GROWER SHAMPOOH®is safe because it is made of natural components that do not cause any harmful side effects. Are there any contraindications from using IKUMOU HAIR GROWER SHAMPOO® As a matter of precaution, IKUMOU HAIR GROWER SHAMPOO® is not recommended to pregnant and breastfeeding women, children under 12 years old, and people who have allergic reactions to any of its components. Can IKUMOU HAIR GROWER SHAMPOO® be used for chemically-treated hair? As a rule of thumb, any person with chemically treated hair or has undergone any salon treatment may use IKUMOU HAIR GROWER SHAMPOO® but must observe a resting period of 2-4 weeks if the salon chemical treatment used might produce any allergies or hypersensitivities. This is recommended to be able to identify with certainty the real cause of the adverse reaction/s and not put the blame on IKUMOU HAIR GROWER SHAMPOO®. All the active ingredients of IKUMOU HAIR GROWER SHAMPOO® are natural and safe. However, we can’t vouch for the safety profile of salon treatments. While on IKUMOU HAIR GROWER SHAMPOO®, the person needs to refrain using any hair products with high concentrations of chemicals for this may defeat the purpose. Should the person opt to have another salon treatment while on IKUMOU HAIR GROWER SHAMPOO® treatment, the person should stop using the IKUMOU HAIR GROWER SHAMPOO®. If one is currently using another hair growth solution, how soon can he/she start using IKUMOU HAIR GROWER SHAMPOO®? A person should stop using the other hair growth solution for 1 month before he/she can start using IKUMOU HAIR GROWER SHAMPOO®. What hair products should be avoided in using the IKUMOU HAIR GROWER SHAMPOOWhen using IKUMOU HAIR GROWER SHAMPOOH®, it is advised to avoid using hair spray, gel, wax, or mousse. It is also highly advised to use herbal-based shampoo – IKUMOU HAIR GROWER SHAMPOO® Can I stop using IKUMOU HAIR GROWER SHAMPOO® after achieving the desired results? After achieving the desired results, you may pause for two (2) months then start another treatment for the next 2-8 months..